Synopsis: “Betty Plum has never been in love. She’s never even kissed a boy. But when H.O.T. Toby starts school it’s like Betty has been hit with a thousand of Cupid’s arrows. It’s like a bomb has exploded – a love bomb! Have you read the first book, Flirty Dancing? 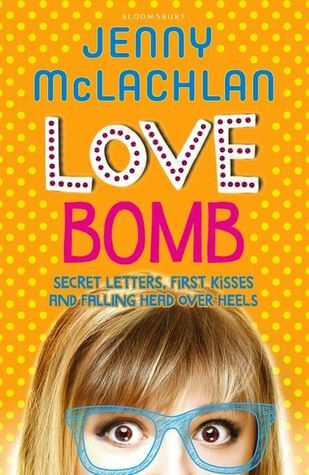 Read my review before you continue onto Love Bomb! The Ladybirds are back, and this time we get to follow the unique Betty Plum as she navigates high school, boys and her dad’s new girlfriend. Flirty Dancing gave us a glimpse into Betty’s world and I absolutely loved it. Love Bomb – if you can believe it – was even better. There was a deeper sense of emotional depth in this book as Betty finally comes to terms with the loss of her mother in her life, especially during the period in high school where a girl needs her mother most. Betty’s mother passed away from cancer when Betty was two, but has written a birthday letter for her every year. As she turns fifteen, she finds out that that is the last birthday letter she’ll ever receive – BUT there are some secret ones hidden away in the attic reserved for the momentous times in Betty’s life when she needs them the most. These letters are beautiful and personal, making Betty’s mum come alive through the page. I am not ashamed to say that I bawled my eyes out because of how moving they were. What can I say, I’m a sap. The relationships in this book are beautifully written and Betty is just another normal teenage girl with teenage problems. She’s a brat when her dad brings home a new girlfriend, and she chooses to perform in the school talent show with the new hottie instead of her best friend. McLachlan deals with teenage relationship in a very realistic way, and I was glad to see that these character were not overly dramatic with their actions. I really enjoyed reading the romance, and if you have read my discussion on ‘players’, then you’ll know why I adored it so much in this book. Betty’s crush was by no means a ‘player’ but he was also not exactly the role model boyfriend that teenage girls should look up to. I don’t want to spoil anything, but I will say that I wholeheartedly approve of her final boyfriend choice. Love Bomb does tend to read a little young (I felt like it’s more targeted towards 10-13 year olds) but the overall messages can be enjoyed by everyone. I absolutely loved it and if you’re a crier like me…then have the tissues ready. I hope you all fall in love with Betty’s story as much as I did! Thank you Bloomsbury Australia for providing an ARC in exchange for an honest review.